Spark 35-40 cm but not full tuning. Now, i build new driver like UD2.5 but fdd8424 or IXDD430MYI driver sellectable. Some problem with GDT and phase lead adj. I have some problem with phaese lead adjust and gate driver signal. 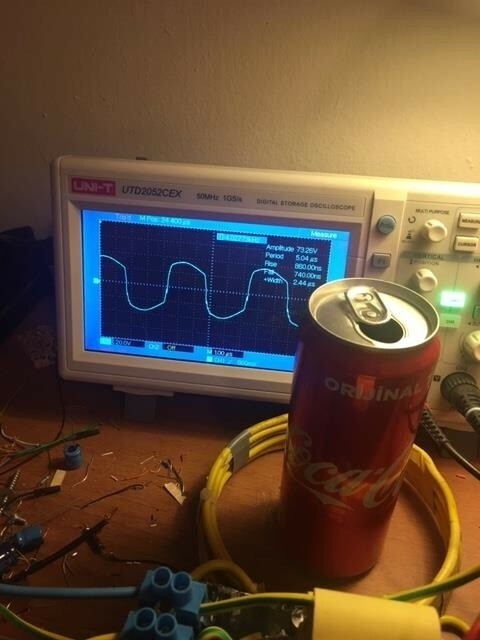 I connect 200 kHz to the FB input with 555. 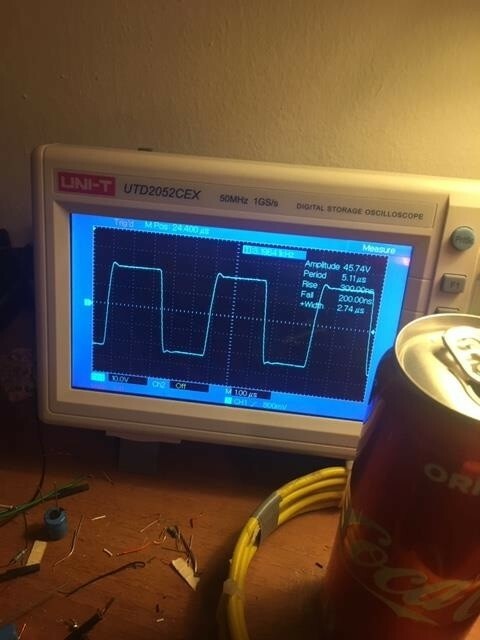 If I don't give bus voltage, an excellent square wave gate signal is generated. But if I connect bus voltage or/and connect ct to fb, the gate signal is distorted and +-40 volts rise. interesting, oscilloscope 50v/div to 100v/div. Changing waveform??? 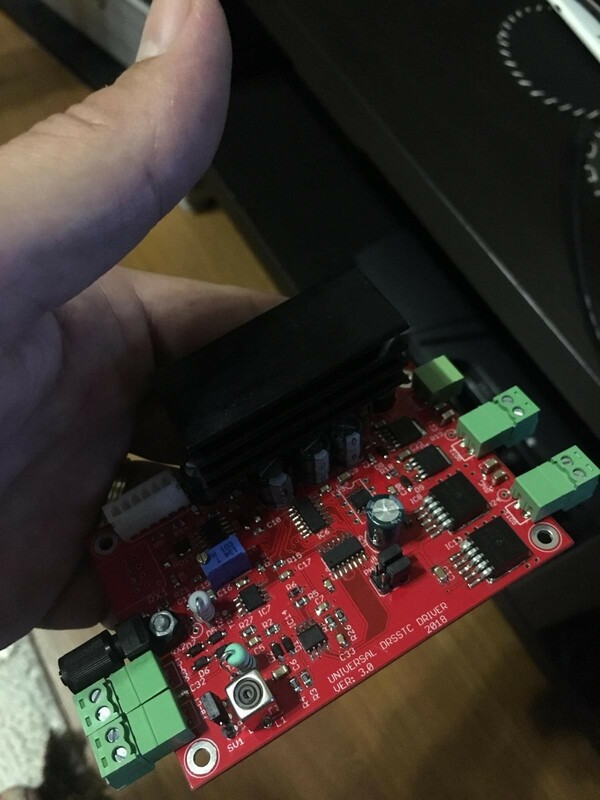 Who made that red UD3.0 driver board? You mentioned UD2.5? UD1.3 is a sturdy little beast and can drive almost anything with large disturbances and unbalances. The phaselead UD's from 2.1 and up are however much more sensitive to excessive energy in the system and therefore it is often needed to have a 1-2K power resistor across the inverter output to remove any residual charge that will ruin the oscillation feedback. The large spikes you are talking about is that on the inverter output or on the IGBT gates? If you are testing at low DC bus voltage, the switching spikes will look very large compared to the DC bus voltage, but fear not, it is just the output capacitance of the IGBT playing a game with you, these spikes only look big because you test at low voltage. The large spikes you are talking about is that on the inverter output or on the IGBT gates? The phaselead UD's from 2.1 and up are however much more sensitive to excessive energy in the system and therefore it is often needed to have a 1-2K power resistor across the inverter output to remove any residual charge that will ruin the oscillation feedback. With the board I built that uses phase lead, without placing it in a metal box, and putting chokes on the transformers coming into the circuit board, the board was very susceptible to noise as it is placed right under the tesla coil. 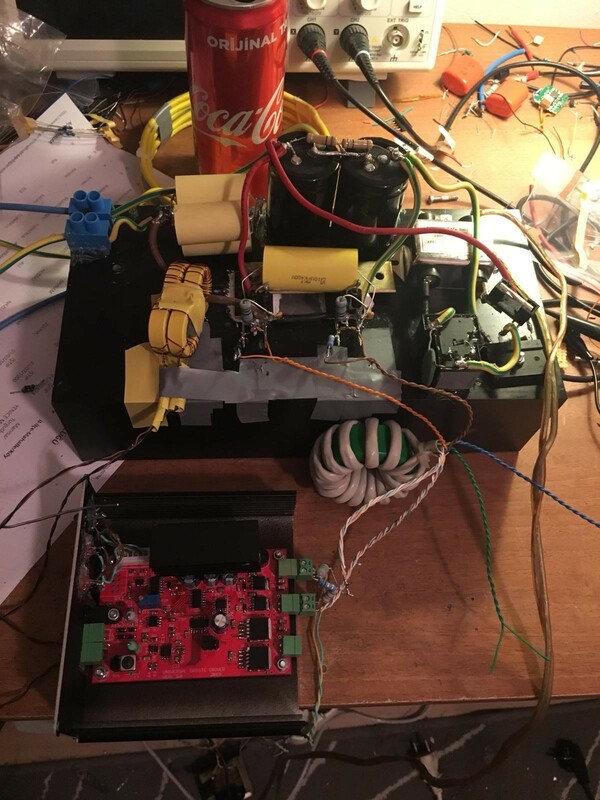 I choked the power supply cable, the gate drive transformer, and the current sense transformers, and had an aluminum box around the circuit as well, though I could operate it with the top off when tuning with relatively low bus voltage. You can make a simple choke by getting a ferrite toroid, twisting the two leads together, and wrapping the leads several times around the toroid. The phase lead inductor coil I used was not shielded so it probably was picking up some magnetic field from the tesla coil itself, as it is basically behaves like a ferrite loopstick antenna similar to those used in AM radios. This is one reason having a good metal box around the circuit is critical. Reduced GDT winding, 15 to 13. IGBT gate to source signal, insignificant miller effect and some noise. You can make a simple choke by getting a ferrite toroid, twisting the two leads together, and wrapping the leads several times around the toroid. I increased the windings of feedback toroidals and used a larger toroid. I'm now using T130-26 in 1/625 ratio. Can now adjust phase lead. 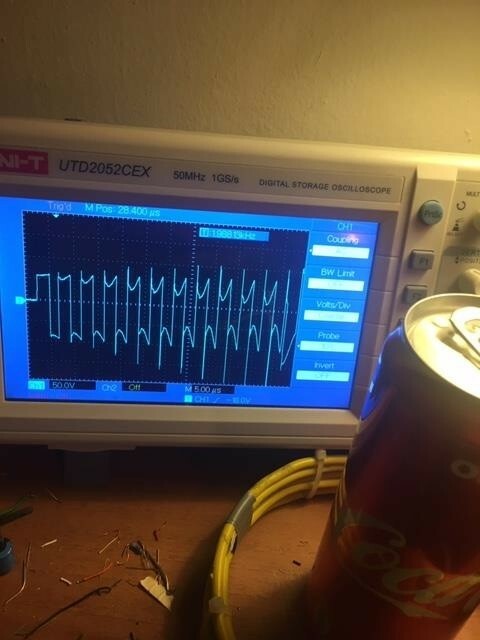 Is the voltage collapse in this picture important? The gate driver transformer is typically bifilar wrapped around a ferrite core NOT an iron powder core (there's a difference). T130-26 is a micrometals iron powder material typically used for power inductors with a permeability of 75. It's designed to be a low-loss inductor, and is not as good as a transformer core. Most MnZn ferrites are have permeability typically in the thousands. A good toroid would be something like a FT82-77 should be sufficient. It has a permeability over 2000 and is good up to a few MHz. But there are many materials that would work, also a FT82-43, even though it has a permeability of only 850, is ok too. And it must be wound bifilar to have good magnetic coupling between the primary and secondary turns. Good catch Dan, that sure could be the culprit for skew and distorted waveforms. Generally I just use the same material, in varying sizes for both GDT and CT. I've read a lot about working better at the big Al in GDT. When it comes to ferrite, it is necessary to increase the core diameter or the number of turns. In this project, I tried Ferroxcube Tx 40/24/16 3E27 (like N30), Cosmoferrites 36/21/15 mm CF199, 49/32/19 mm CF197 type materials for GDT. What determines the number of turns is the impedance of the load. At the frequency of use, the impedance of the coil must be greater than the load, so that the primary side coil should have an impedance much greater (3-4 X at least) as the driving impedance, and the secondary side should be much greater than the load impedance. A IGBT or MOSFET gate is a capacitor and actually a fairly low impedance. You can always increase the number of turns, assuring that the impedance of the coil is higher than the mosfet gate, but the leakage inductance increases as well. A bifilar winding will make the leakage inductance very low and this should not be a problem. Take two different color wires, twist them together, wind them together around the toroid perhaps 10 times, and then you have a 1:1 transformer with one color wire being the primary and the other the secondary. It's very simple to do right once you have the right material. Make sure the insulation on the wire is good for at least 600 volts, so sometimes teflon wires are used, because the insulation is thin reducing the leakage inductance, but maintains a high dielectric resistance. Now i have better result with phase lead. First image no phase lead, second with adjut phase lead. Erdal, I am getting "403 Forbidden" on all your image attachements, is it just me? 115 v AC MIDI testing. 30 cm spark to grounded bar. OCD have set 300 amps, but it's not activated. 230 v AC, low BPS testing. 45-50 cm sparks. my toroid started to throw sparks randomly because of the sharp corners. I didn't ride BPS because I was afraid that the rail wasn't a strike rail and the inverter was working outside. Your GDTs look ok, they are probably ferrite toroids if they are black and have a high permeability 6000 to 9000. I am not sure what kind, but it's probably ok as it is. It can be a problem at the higher frequencies if the ferrite has too low of a bulk resisitivity. You can tell this because you can take your multimeter and measure the resistance between two nearby points on the toroid perhaps a few mm apart and you will see that it reads in the 10 to 1000 kohm range. Higher is better, but with MnZn usually higher permeability means low resistivity, so there's a compromise. Really high permeability 8000-10000 is usually used for low frequency (<100 kHz) switching power supplies, while permeability 1000-3000 is used for medium frequencies (100 kHz to 1 MHz). The 77 mix is good up to 1 MHz, but the permeability is lower than what you have, but if you are using CAT5 twisted pair the leakage inductance shouldn't be a problem. At any rate, if it's working, don't mess with it. I use polypropylene snubber caps 0.1 uf /2000v each total 2 serial + 2 parallel 0.1 uf 4000v DC. Two of the four capacitors are short-circuited. I think, dielectric material is drilled due to high voltage. I Plan to design the new mmc bank 3 serial 3 parallel total 0.1 uf 6000 v.
and with 2 in series 2 in parallel, you are running with a way too low RMS current rating for your MMC and you properly cooked them to death even with the Irms rating for 100 kHz it is bad, so its even worse for 200 kHz. Now, Seconder is 210 khz, Primer is 187 khz. You get some good progress going and make sparks is key! You need a tap able primary coil so you can tune the frequency of the primary circuit more precisely, the sweet spot is within a few centimeters, so its necessary to have large blank surfaces to tap on. If possible, find another place to test your coil, the very close proximity of the wall can make tuning it harder and once you move it out into a "free air/space" area the tuning will not be good anymore. Did you try to add such close proximity walls in JavaTC? It has a really big effect on the secondary circuit resonant frequency.